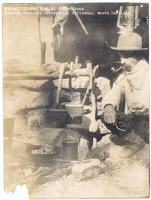 Great article by http://woodtrekker.blogspot.com The Gear of Horace Kephart: "
Horace Kephart is another well respected pioneer in what has come to be known as bushcraft. His book Camping and Woodcraft has been a guide to many outdoorsmen, and you can find a copy of it here. When examining the book, you will notice that it contains two volumes. The first one focuses on camping, while the second volume is on woodsmenship. My interest here lies in the second book because it is more relevant to bushcraft. There are many guide-books on camping which will be able to give you a more up to date view of the available gear. In this post I will focus on the gear he recommends for the woodsman. The first thing that becomes clear when reading the book is that while it was inspired by the example of Nessmuk, it is a much more detail oriented and thought out account of the necessary gear and skills. The length of the book, and the amount of material covered can at times be daunting, but it gives us a much clearer picture of the tools Kephart carried. I will look at two different configurations here-his summer, or warm weather gear, and his winter gear. Pocket/Belt Carry-Map, compass, waterproof matches, pocket knife, bandana, watch, pipe, and sheath knife on the belt, along with another pouch of waterproof matches. Kephart states that he does not like possibles pouches because they get in the way. He prefers to hold important items in his pockets. I completely agree with him on this one. Backpack-Duluth pack-It is made of canvas. It is 24 inches by 26 inches and weighs 2lb 4oz. Clothes-Woolen shirt, woolen drawers, woolen socks, army overcoat, khaki trousers, silk neckerchief, army shoes, army leggings, hat. Kephart advocates against carrying a wool coat, but rather using a thick sweater/stag shirt covered by a rubber cape reaching to the knees or some other waterproof shell. He also carries extra socks and drawers, but they are not included in the weight of the pack provided below. Shelter cloth/tarp-Waterproof canvas, 9ft by 7ft. It weighs 2lb 4oz. Elsewhere in the book he also recommends a tarp made of waterproof balloon silk, 8ft by 7ft. The same weight is given for the silk tarp. Blanket-Made out of wool. For summer, a light blanket 66 inches by 84 inches weighs 3lb. For colder whether a thicker blanket is required, which can weigh up to 5lb. Mosquito net-68 inches by 72 inches in size. It weighs 4oz. Browse bag-This is an empty cotton bag which gets stuffed with leafs and other materials to function as a sleeping mat. It is 32 inches by 78 inches, and weighs 1lb. Pillow bag-It functions exactly like the browse bag. It measures 20 inches by 30 inches, and weighs 3oz. Pocket knife-Kephart recommends a jackknife, with one of the blades being about 3 inches long. Belt knife-He recommends a blade no longer than five inches. The one he uses has a blade that is 4 1/4 inches long, 1 inch wide and 1/8 inches thick. The handle is similarly 4 1/4 inches long, and 3/4 inch thick, tapering to ½ inch at the front. He writes that the Marbles “expert” pattern knife is a good representation of what a knife should look like. He is also credited with designing a knife to his specifications. You can see a picture of it here to the right. There are numerous modern versions of this design, and I find it to be much more useful as a general bushcraft knife than the one used by Nessmuk. Tomahawk-Kephart states that when there is a full size axe in camp, he will only bring a small tomahawk with him. Total weight of the tomahawk that is given in some places is 12oz, but in Volume 1, where he provides more detail about the tool, he specifies that the tomahawk he uses has a 12 oz (3/4 lb) head. The handle is about a foot long. Kephart tries to describe the design of the head, and states that the blade should be narrow, so that the force is concentrated for better penetration. This seems to describe a modern hawk design, but then he goes on to say that a design like the Nessmuk hatchet is ideal. As you’ve seen from the etching in Nessmuk’s book, his axe closely resembles the design of a modern double bit axe. It appears that he simply carries a hatchet/hawk with a 3/4 lb head, something similar to the Gransfors Bruks Outdoor Axe. Pliers-Weight 4oz. It appears that if he was camping these days, his pocket knife and pliers might have been quickly merged into a multi tool. Whetstone-4 inches by 1 inch by ½ inch in size and weighs 2oz. Twine, nails and tacks-4oz in weight. Together the cooking kit weighs 2lb 3oz. There is an interesting cooking set which is attributed to Kephart, that can be seen here and here. First aid kit-5oz in weight. A detailed list of the contents can be seen on page 33 of Volume 1, but technology has long surpassed those items. Wallet fitted with small scissors, needles, sail needle, awl point, two waxed ends, thread on card, sail twine, buttons, safety pins, horse-blanket pins, 2 short fish lines, extra hooks, sinkers, snare wire, rubber bands and she laces. The total weighs 6oz. Comb, tooth brush, tiny mirror, soap in a waterproof bag, rolled in a small towel and secured by a rubber band. Total weight is 6oz. Fly dope (2oz), talcum powder (1oz), toilet paper (1oz), extra matches (2oz), electric flasher (I’m assuming a flashlight) (5oz). This list of gear can be found on page 105 of Volume 2 of Camping and Woodcraft. The total weight given for the pack and its contents is 18lb 3oz. The above list does not provide for any water storage or purification gear. Elsewhere Kephart states that he prefers a US Army 1 qt aluminum canteen with a felt-lined canvas cover. When more water is needed, he recommends a collapsible rubber water container. As 1L of water weighs about 2.2lb, adding 2L of water to the above weight, along with a canteen, will add another 5lb to the pack. This still does not reflect any water purification gear. Bread or prepared flour, cereal, milk powder, butter, bacon, cheese, egg powder, dried fruit, sugar, chocolate, coffee, tea. The total weight of two days of rations is given as about 5lb. This brings the total weight of the pack, including two (2) days of food and 2L of water to 28lb. The winter gear outlined by Kephart, is shown in an abbreviated list on page 145 of the second volume. It closely resembles the summer gear with some specific alterations. Here I will go through the changes or additions that he recommends for winter camping. The first significant change is to the shelter system. The tarp that was recommended for milder weather is exchanged with a canvas half tent of approximately 4 lb in weight. The reason given is that a tarp is too breezy. The second change to the shelter system is the replacement of a blanket with a sleeping bag. Earlier in the first volume of the book, Kephart explained that to carry enough blankets to equal the warmth provided by a sleeping bag would be weight prohibitive. For that same reason he recommends the change to a sleeping bag. The weight of the sleeping bag is given as 8 lb. Keep in mind that here he is referring to 100 year old sleeping bag technology. The last change to the shelter system is the removal of the browse bag. Instead of this bag, Kephart recommends bringing an axe which you can use to gather the necessary bedding materials. The major change in tools is the one pointed to above. The small tomahawk is replaced with an axe. Kephart speaks of a full size axe with a 3 ½ lb head, but the weight measurement he provides is 1 lb 12oz. This would make the axe similar to the size of a Small Forest Axe. In Volume 1 he states that a good axe for heavy work that can be taken on a canoe trip where no full size axe is available in camp, would have a 2 lb head and a 18 inch handle. He seems to like a Hudson Bay or Damascus pattern axe. He also recommends the use of a small file for sharpening. The additional clothing that is recommended is a Mackinaw shirt, spare underwear and spare socks, moccasins, and German socks. The additional items that are listed are a folding lantern and candles, along with some extra matches. Kephart points out that it is not uncommon that with food, a winter pack may weigh 50 or 60 lb. He recommends that a hunter out during winter carry enough food for a few days until he can start providing himself with food from hunting. When compared to Nessmuk, I found Kephart’s approach to gear selection to be well documented and thought out. The weight of every piece of gear is properly recorded, and the lists are complete and vary depending on the environmental conditions. If we go through his gear lists, and update each item with its modern equivalent (an act of which I believe he would approve), we would see a set of gear, which can be readily found on the trails today. As with Nessmuk, the only piece of gear that is common today, which is no where to be seen in Kephart’s writings is a water purification system. Thanks for sharing this informative blog.After study a few of the posts on this website now, and I truly like your way of blogging.Thanks!